Which cookbooks will help you save money and eat healthy? I’m the kind of person who reads cookbook like novels – cover to cover. Then I put sticky tabs on all the recipes I want to try, and over the coming months (and years – let’s be honest), I try them. I don’t know how you can’t read a book with a tag line like that. This is a real food classic. I don’t know how many natural living and healthy eating blogs Nourishing Traditions helped start as it turned peoples’ worlds upside down. But it must be in the hundreds if not thousands. My mom brought this tome home a few years after we ditched the Wonder Bread and bought an electric grain mill to grind our own flour. It was a game changer. When I moved away, she sent her copy with me. I read it like a textbook. While it wasn’t life-changing for me – largely because we had already adopted most of the concepts by the time I moved out – it filled in the gaps I hadn’t learned by osmosis. It showed me why I wanted to continue eating the way I grew up. 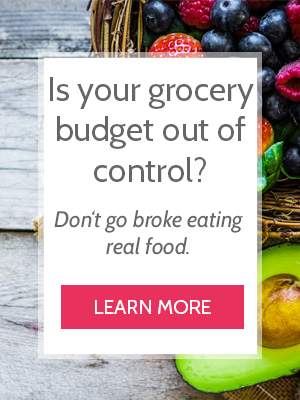 At the time, our grocery budget was $25/week. So real food was easier said than done. However, Sally Fallon fueled a fire that refused to go out. Between her recipes and boxes of free produce from my part time job, we made it. It’s a real food textbook. If you don’t understand real food, or if you are a geek like me and need all of the why behind eating healthy, read this book. The main premise is that for thousands of years, human beings thrived by eating the food that naturally occurred in their environment. They didn’t have dentists or Claritin, sleep apnea machines or coconut oil (most of them), but they thrived. If we can eat more local, naturally occurring food from the world around us, we will probably be better off. Obviously, this gets tricky depending on where you live, so Nourishing Traditions breaks it down into practical facts, theories, and recipes. It teaches you methods of preparing food that people used for thousands of years but forgot in the last hundred (fermentation, anyone?). After walking you through each food group (fats, carbohydrates, proteins, dairy, spices, etc. ), it arms you with practical, real food recipes. It is one of the sources that inspired me to soak my grains overnight for the gluten-sensitive people in my family (which lead to Non-Crumbly Whole Grain Sandwich Bread), learn how to make homemade yogurt (this is the first recipe I tried), and keep trying sourdough even when I failed the first few times. Some of the recipes miss the mark. Maybe my palette is too modern, but they were either too complicated or didn’t taste great. As the authors explain what’s wrong with our modern food system, it’s easy to start approaching food from a place of fear. Everything in the grocery store looks like poison after reading this book, and it can drive you crazy. But that is not a healthy way to approach life or food. Let’s be informed, let’s be smart, but let’s not let fear dictate our choices. Cooking this way is expensive. You have to balance your information with your real life budget and choose your priorities. The tone of the book is very black and white, which I can respect because of all the research the authors put into this book. However, I refuse to take anyone’s word as law when it comes to healthy eating, and that includes Sally Fallon. I balance this book with Mark Bittman, Michael Pollan, Dr. Fuhrman, and Brian Wendel, with deep respect to each influencer’s journey, and I found a healthy balance. Nourishing Traditions is one of my favorite cookbooks because it challenged what I thought I knew about food. It helped equip me with skills that were lost to my family after the modern food system. It gave me practical recipes as I figured out what real food looked like for us. Check the book out here or find it at your local library! Have you read Nourishing Traditions? What do you think about it? Yes, alot of complicated recipes. Still the info is impacting.